← Giveaway announcing SAY NO MORE by Liliana Hart ~ a wonderful series of happy-ever-after and scary moments! My Thoughts: As I dry my eyes from sorrow and joy, I come away from this story in awe. But then, Scott is the first-born of William de Wolf, and we cannot expect anything but greatness. Everyone deals with death of a loved one differently. Most would break down and weep over those they’ve lost. The grieving of a lost love is emotionally impactful, and the beginning of healing for those who are left behind. Scott isn’t like most. His immediate response to the death of his wife, his two youngest children, his sister-in-law and her two children is so devastating to him, he is unable to outwardly grieve. His heart is shattered, but no tears come. Scott has failed his father, the one he needs to feel proud of him. Scott feels guilt for not being there to save his family. This guilt and grieving he bottles up. He can’t face his family, therefore walks away, not to see them for three years. During this time, the gregarious, light-hearted man dies and in his stead is a knight with no compassion. On the battle field, he strikes like a viper, and is known as the Black Adder. There is no longer any joy in his life, no smiles, no laughter. Few original knights remain with him as he fights for the king. Those who have joined him after this tragic day, know him as one not to cross. Change is in the air when Nathaniel, a long-trusted knight and friend of earlier days, takes an arrow meant for Scott. He has been asked by the king to secure Nathaniel’s Castle Canaan until such time the king can find a suitable man to permanently protect the castle, one to marry the widow. Scott finds Avrielle, Nathaniel’s widow, so grieved for her lost she is close to losing her mind. He sees Avrielle breathtaking, reaching out to her in her grief. These two souls find a connection, a bond of pain, if you will, from that comes trust and eventually a deep and lasting love. He struggles to find the peace he needs. He didn’t want to give in to those weak feelings of compassion and gentleness and humor that had cost him so much when Athena and the children had died. He blamed the human part of him for all of the pain he’s suffered at that time. Avrielle’s brother, Jeremy does not see his presence of any benefit. He has battled alongside Scott for some years, but now he thinks he’s there to take Castle Canaan from him. Jeremy has issues, too. He has screwed up his life with drink, and Arielle’s husband had given him a home at Castle Canaan, along with Gordon, his father. Jeremy had been loyal to Nathaniel. He couldn’t tolerate Scott. Lots of contention between the du Rennic knights and Scott’s, which finally comes to blows. Other dangers surface and the knights must work together to eliminate outside perils. While experiencing the Avrielle’s grief, I began to understand the deeper grief Scott had. His hurt and guilt is intense, more than Avrielle’s for he’s buried it long. He does not doubt he will always be the man he has become. I enjoyed the part Stewart, Scott’s long-time knight, plays and his friendship which endures beyond Scott’s treatment of him. Some happier moments are just as engaging when Scott loses himself in the joy of children, Avrielle’s children. Sadly, he doubts his sons will ever forgive him for turning his back and running away. I enjoyed the banter between Scott and Avrielle discovering a new-found love. In this story, another viper rears its ugly head. The viper of greed, ready to destroy all those who stand in the way. Kathryn Le Veque brings home very poignantly a father’s love is unconditional and a man’s determination to keep what is his own safe. Le Veque, in her usual manner, wrings tears from my eyes, some of sorrow, others joy, very neatly woven into a story as rich as it is enjoyable. 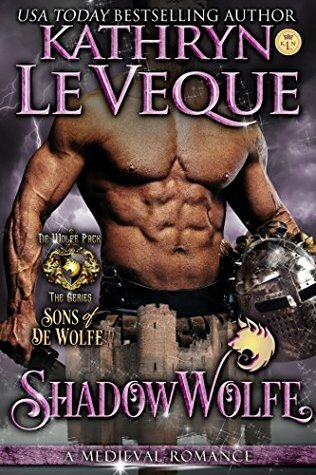 This entry was posted in Historical Romance, Medieval Romance, New Book Release, Romance and tagged de Wolfe Pack Series, Kathryn Le Veque, ShadowWolfe. Bookmark the permalink. Lovely review, Eileen. I must admit that the Medieval period has never held much appeal for me. I prefer stories set in the Georgian, Regency, Victorian and Edwardian eras.